Eros International presents in association with Vijay Galani Moviez Production film “Veer.” The film is directed by Anil Sharma and the music of the film is composed by duo Sajid – Wajid with beautiful lyrics written by lyricist Gulzar. 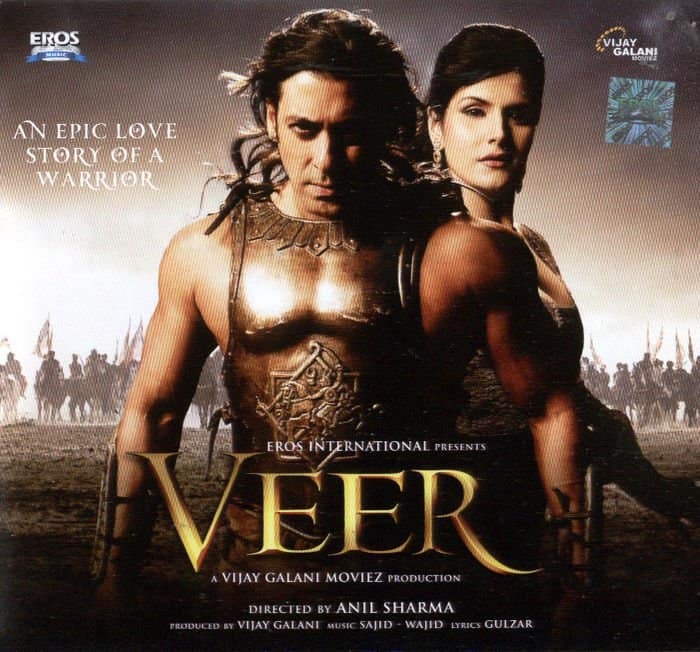 The music album of “Veer” consists of 8 mind blowing tracks. The first song of the film “Taali” is a powerful song sung by Sukhwinder Singh, Sonu Nigam, Wajid and Neuman Pinto. “Taali” is an energetic song which makes a good start for the album and has been repeated once more in a solo version sung by Sukhwinder Singh. The next track “Surili Ankhiyon Wale” is a solo song by Rahet Fateh Ali Khan. It’s a romantic song sung at a low pitch tune which makes it’s extremely melodious. This soothing track is repeated once again in a duet form by Rahet Fateh Ali Khan and Sunidhi Chauhan and the English vocals are by Suzanne D’Mello in both the tracks. “Meherbaniyan” is the fourth solo song sung by soothing Sonu Nigam. The fifth song “Kanha” (Thumri) is a soft classical song and is amazingly blended with vocals by Rekha Bharadwaj, Shabab Sabri, Toshi and Sharib. 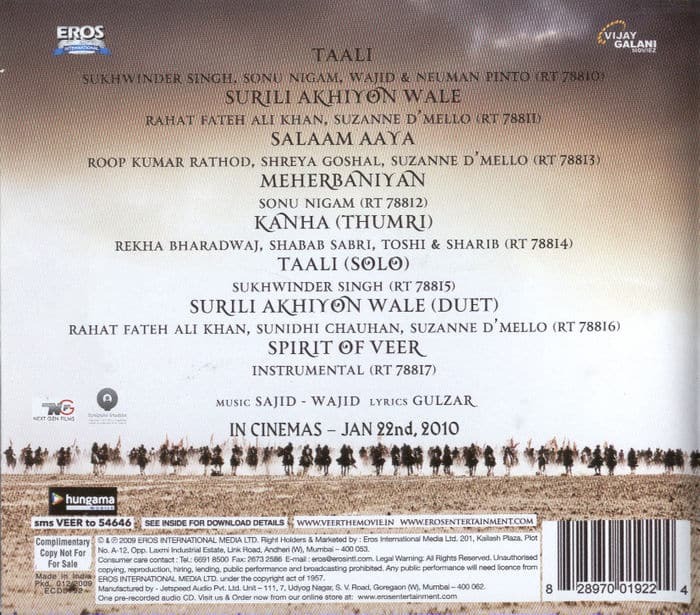 The last track is “Spirit of Veer” which is an instrumental song well composed by Sajid – Wajid. The songs of “Veer” are a pleasant surprise which is a complete shift from fast paced songs these days. The songs of Veer takes you back to period of 90’s when songs used to be completely romantic and passionate and will be liked by all.